I did not get expected result from the design and I will keep on trying some different ideas before I publish it here. If you interested to try this design I have a few boards left and I sell it at cost for $17.00 dollar each. 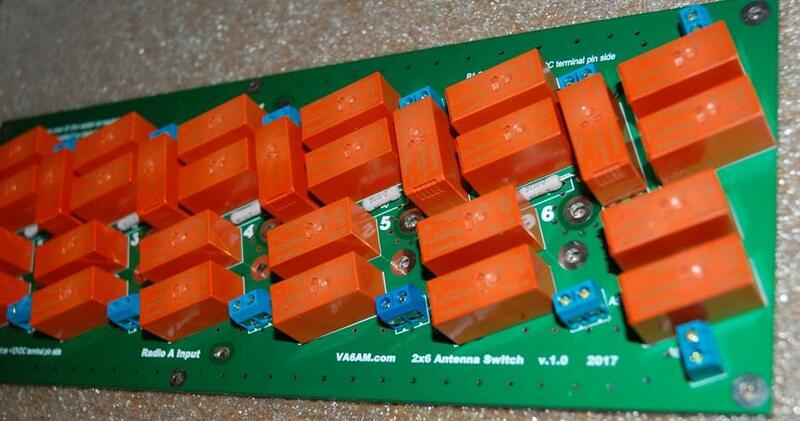 It can be built using 5 or 3 relays per band. Three relays would have less contact capacitance and a higher band isolation achievable. For lower power setup this board will work perfectly. There are many 2×6 switches existed but I wanted to design and build my own. Below is a partial schematics of one band of the 2×6 antenna switch. There are two-relays-in-series to each radio leg to increase an isolation. There is an extra relay to control 50 Ohm resistor. The photo below is the first assembled board before going into an enclosure. Four relays in a row is a good idea to increase an isolation…if it is not a 2×6 switch. All capacitance between relay contacts will be summed up for all 6 bands and as a result the Radio port isolation degraded. So, for this design a right relay type should be chosen. This was my mistake of used relay type soldered into the board and as a result lower number than that I was expecting. I would like to check more relays before I make another try for the board design.